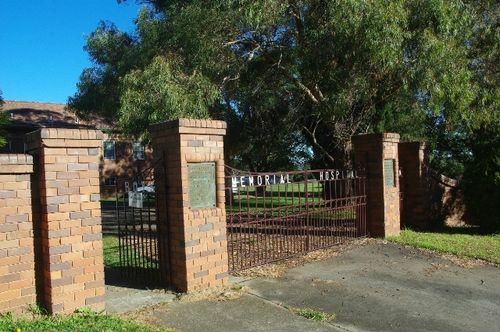 The Memorial Gates at the entrance of the Boystown Hospital in Engadine were erected by the Australian Meat and Allied Trades Union in 1944 in memory of those men from the industry who died in service or were killed in action during World War Two. This war had not ended so the finish year was left open. The memorial gates and hospital were dedicated to members of the Meat Industry and Allied Trades who lost their lives in World War Two. Boys` Town Memorial Hospital was officially dedicated on May 19, 1946. The Boys Town Memorial Hospital is now the Dunlea Centre. The foundation stone of the Meat Industry's Memorial Hospital at Boys' Town, Engadine, was laid yesterday afternoon by Father T. V. Dunlea, founder of Boys' Town. More than 5,000 people were present. Memorial gates at the main entrance were unveiled by Mr. Joseph Merrett, Metropolitan Meat Industry Commissioner. The hospital will be a memorial to members of the meat industry and allied trades killed on war service. On completion of the hospital it is proposed that boys admitted to Boys' Town should pass through the hospital for physical and mental examination. One ward will be used for convalescent boys recovering from serious illnesses. Father Dunlea said that donations of £1,000 had been received during the afternoon. He appealed to philanthropists to do something for the rehabilitation of boys leaving gaol. The Sydney Morning Herald (NSW), 29 May 1944. Boys' Town Memorial Hospital, which has been built by the Australian Meat and Allied Industries as a memorial to members of the industry whose lives were lost in World War II, was officially handed over for the use of Boys'Town, Engadine, N.S.W., and dedicated to Australian Youth on Sunday, May 19. The hospital, which is said to be the only hospital of its kind in the world, will increase the population of Boys' Town by 50. All boys going to Boys` Town will be admitted through the hospital which provides wards for admissions, malnutrition cases, observation and convalescence, besides an infirmary, a complete isolation wing, dining-room for 40, suite of' rooms for matron ,staff quarters, etc. The hospital is completely equipped with dental, optical and chiropody departments. It has an operating theatre, where minor operations will be undertaken. In the memorial vestibule, dedicated to the memory of Sergeant-Pilot Peter Hutton and Sergeant Pilot Tony Paul, whose deaths in action inspired the building of the memorial, a roll of honour, surmounted by the Legacy Torch,will bear the names of members of the and Meat Allied Industries throughout the Commonwealth. The Sydney Morning Herald (NSW), 10 July 1946.